Whether they climb a fence, or explode on their own with gorgeous sprays of colorful and fragrant blooms, old roses are a source of pure delight. And in April and May, they are in all their glory. With names that run the gamut from “Baron Girod d l’Ain,” to “Ispahan” to “Tuscany,” heritage roses evoke history and poetry. Rose lovers will get their fix this Sunday at the annual Celebration of Old Roses, sponsored by the Heritage Roses Group Bay Area (HRGBA). This annual spring event is one of the few remaining places where we can see, smell, talk, and purchase old roses. It takes place this Sunday at the Albany Veteran’s Memorial Building from 11 a.m. to 3:30 p.m.
Officially, old roses, or antique roses, are varieties that date from 1860 or earlier. Devotees praise their colors, their rich and varied fragrances and their graceful growth habits which make them ideal for the garden. Once established, many are drought tolerant too, so in these times when many are culling plants to save water, an old rose can make sense. For those unable to have a rose garden at this time, the Albany event is a chance to see dozens of roses without the responsibility of ownership. Much like a delightful old-fashioned country fair, people gather round to ohh and ahh its focal point—a 100-foot plus display of freshly picked old roses in old-fashioned mason jars, all in glorious states of bloom. 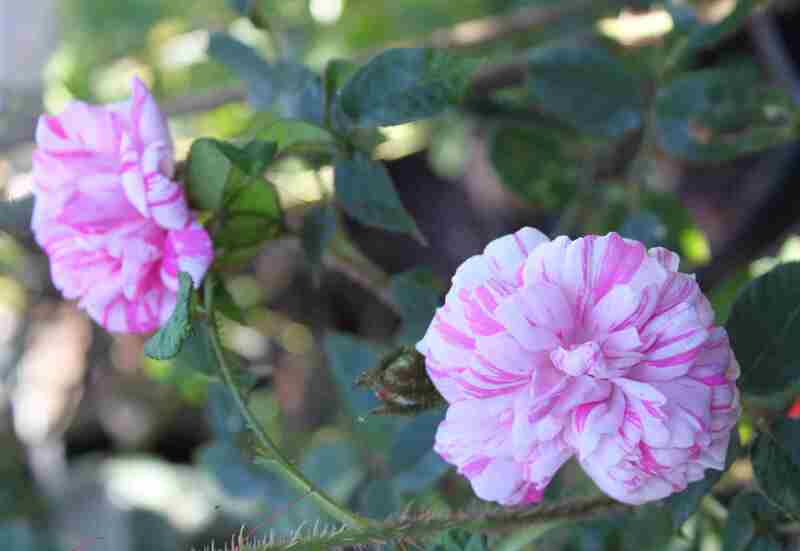 The roses are organized by class—gallicas, centifolias, damasks, mosses, hybrid Chinas, bourbons, Portlands, teas, eglantines, floribundas and others. There is ample opportunity to explore the nuances of each variety—fragrance, color, size, petal count, foliage and growth habit. In addition to the display and sale of old roses, rose experts who have made it their mission to save and perpetuate this diverse group of plants will be on hand to answer questions. Have a rose that you can’t identify? Just put a complete cutting (full bloom, bud and some foliage) in a jar and bring it to the event and the experts will try to identify your rose. Vendors will also be selling rare perennials, rose books, rose greeting cards, and other items inspired by roses. This year, all children attending the event will receive a free rose plant, courtesy of Tom Liggett and HRGBA. Who doesn’t love old roses? A symbol of beauty, love, war and politics, roses have their place in history and our hearts. 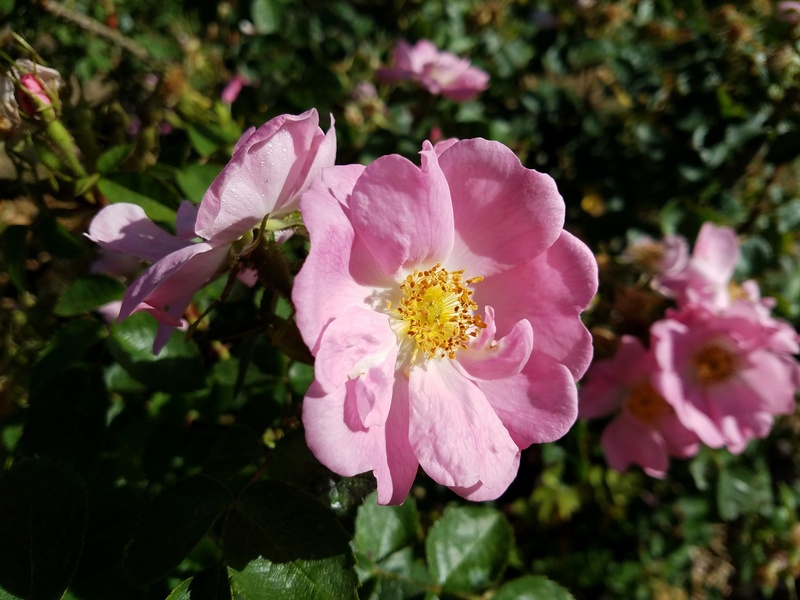 I’ll be swimming in roses this Sunday at El Cerrito’s 33rd annual Celebration of Old Roses…it’s a yearly trek I make along with a number of other old rose devotees from all over California where we can see, smell and talk old roses with other addicts. 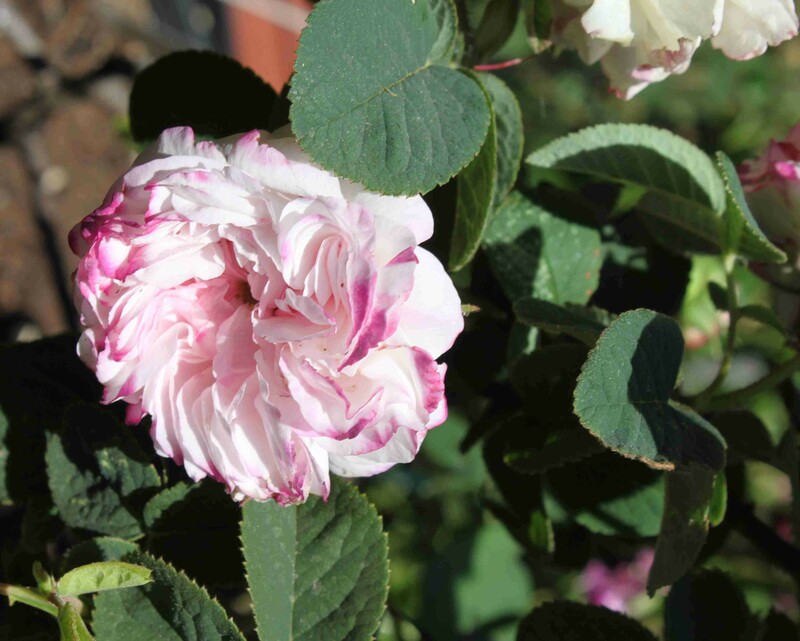 The annual spring event is sponsored by the Heritage Roses Group and takes place at the El Cerrito Community Center from 11 a.m. to 3:30 p.m.
Old roses or antique roses are varieties that date from 1860 or earlier. Their attractiveness grows from their wonderful rich and varied fragrances, graceful growth habit which makes them ideal for the garden and disease resistance. The celebration in El Cerrito works like an old-fashioned country fair—visitors walk along and encounter a wonderful menagerie of mason jars filled with freshly picked old roses which have been organized by class—gallicas, centifolias, damasks, mosses, hybrid chinas, bourbons, portlands, chinas, teas, eglantines, floribundas and others—all in glorious states of bloom. 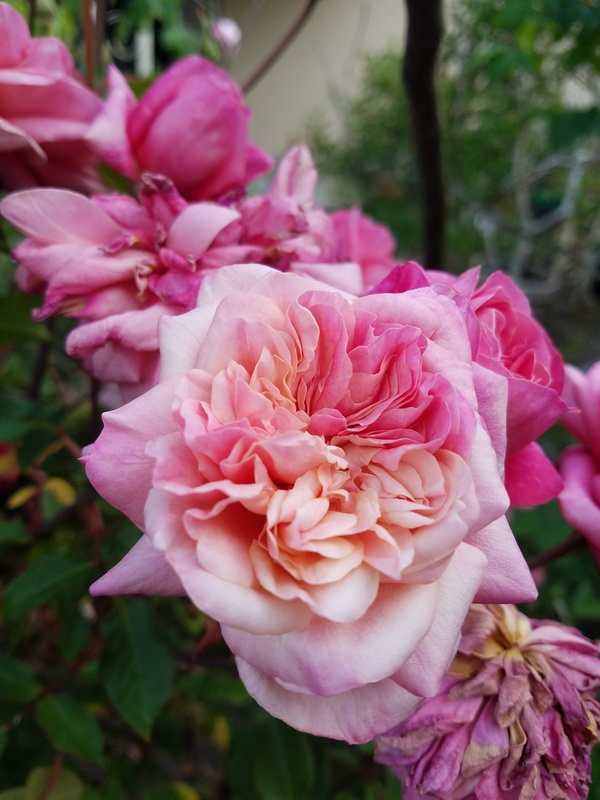 There is ample opportunity to explore the nuances of each variety—fragrance, color, size, petal count, foliage and growth habit– and there are educational rose books, light refreshments and a proliferation of rosy knick-knacks. You are also welcome to bring your own roses for display, including any mysterious roses you need identified for the “Unidentified Rose Table.” Children will receive free rose plants and there will be some fun activities to keep them occupied. And, of course, there are old rose vendors from all over who will be selling rare old roses, most of which are own root roses. Last year, I bought an unidentified but very hearty looking rose in a pot for $7 and it turned out to be Superb Tuscan…a major coup! Among purveyors and supporters of old roses, Vintage Gardens of Sebastopol, stands out. 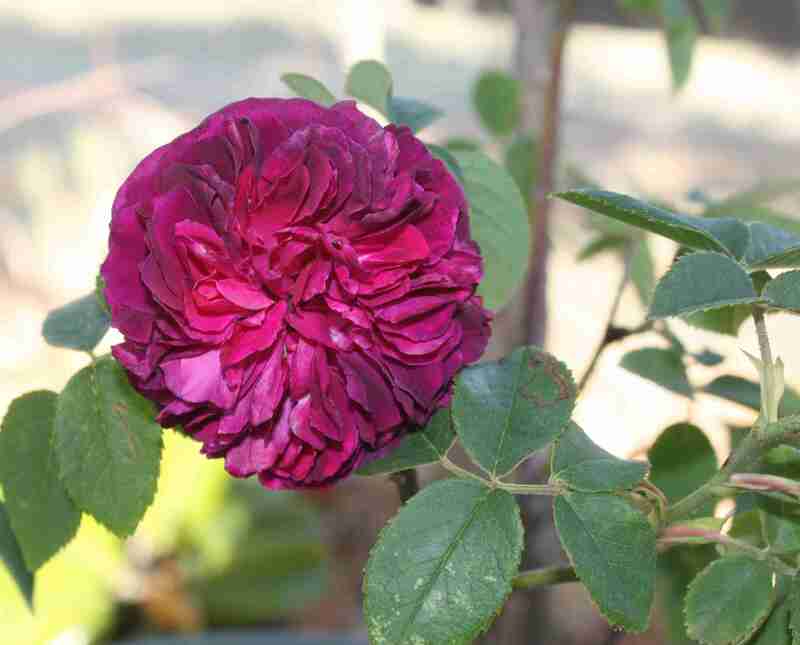 Over the years, it has emerged as one of the country’s prime suppliers of rare old roses. Its owners, rose gurus, Gregg Lowery and Phillip Robinson, through their enthusiasm and thoughtful scholarship, have really raised awareness and interest in these lovely plants. A dog-eared and pen-marked copy of their Vintage Gardens Complete Catalogue of Antique and Extraordinary Roses is staple in any serious collector’s home. This must-have catalogue gives an utterly riveting blow by blow accounting of the properties of nearly 3000 old and very rare roses. For the past 29 years, Vintage Gardens has persisted through boom and bust but, like so many rose nurseries, it has finally succumbed to economic hard times and will stop selling roses on June 30, 2013. This comes as a blow to those in the rose community and will mean a very significant loss of resources to lover of old roses who have been buying rare roses from Gregg Lowery for years. Without Vintage Gardens, my antique rose garden, and many other Bay Area old rose gardens, would not exist. With their help, I’ve added some 150 plants to my garden over the past 14 years, a true labor of love. Thanks to the efforts of a group of old rose lovers, Lowery’s collection of several thousand old roses that he developed with Phillip Robinson beginning in the late 1970’s, will be saved. A new non-profit, the Friends of Vintage Roses, assisted by the Heritage Rose Foundation, has begun the work of stabilizing and restoring the collection of old and rare roses that once numbered over 5000 varieties. Gregg will be in El Cerrito this weekend and it’s bound to be an emotional experience. Stay-tuned to ARThound for more coverage of Vintage Gardens closing. 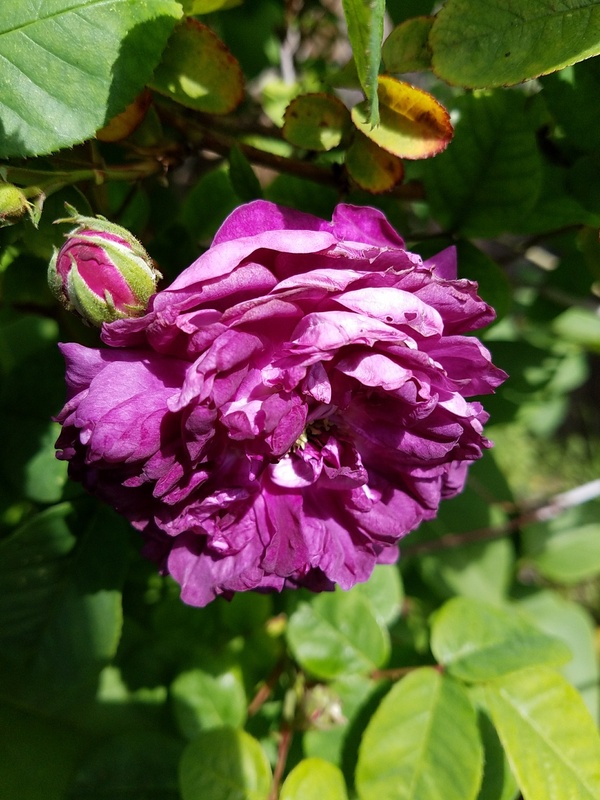 Old rose events like the one in El Cerrito sustain those of us who are hungry to see, smell and compare rare roses and to road test the extensive knowledge we’ve gleaned from late-night reading and dog-earring of our rose books. 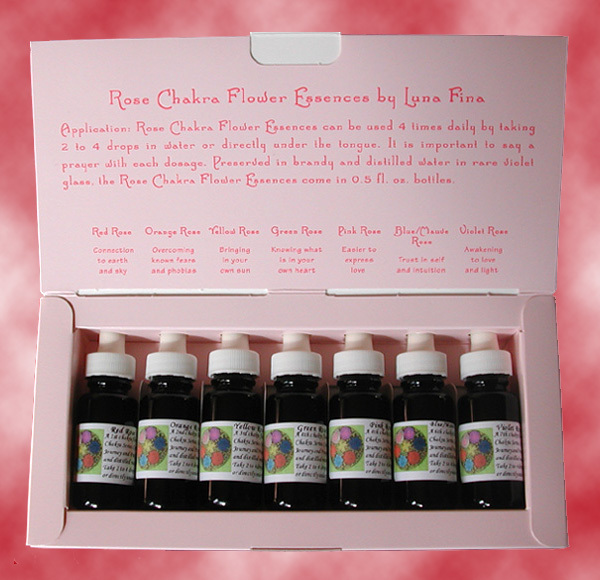 Annabella DeMattei, founder of Luna Fina, distills special roses in organic brandy and distilled water to create healing and aligning Rose Chakra Flower Essences which she sells in sets or individually. Each bottle comes with a delightful card, an artwork itself, which explains all about the drops and their properties. Another fabulous aspect of El Cerrito’s celebration is the chance to try and buy some very high quality and in some cases, unusual, rose products. Last year, I had a delightful conversation with Annabella DeMattei, Luna Fina founder, who distills special roses in organic brandy and distilled water to create Rose Chakra Flower Essences. Widely used as traditional remedies, flower essences are respected for their abilities to promote physical, emotional and spiritual well-being. Annabella says that each of her essences is attuned to one of the seven chakras and a few drops on a regular basis will provide a unique opportunity to summon forth the full experiential bounty of the chakras, which each hold certain qualities representing aspects of the self. She chooses special roses to distill that correspond with both the color and qualities of each chakra and sells them as sets. These drops have been a huge hit with my friends. Do drop by and explain your issues to Annabella and she’ll rosey you up. While roaming the vendor area, you have your graden tools sharpened by Eric the Joiner. Heritage Roses Group: Rose shows require extensive planning, organization and support. 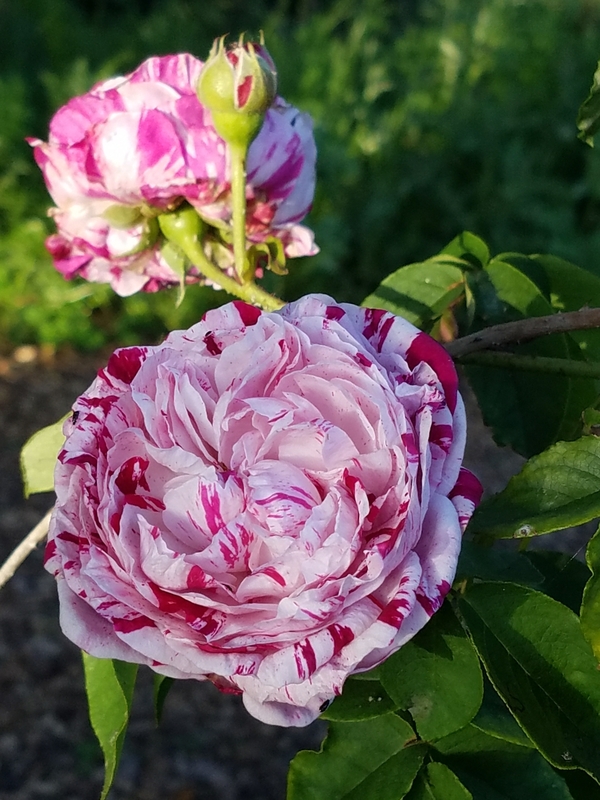 The Heritage Roses Group, formed in 1975, which has Bay Area chapter, is a community of those who care about old garden roses, species roses, old or unusual roses – particularly those roses introduced into commerce prior to the year 1867. The group’s purposes are to preserve, enjoy, and share knowledge about the old roses. Every year, the San Francisco bay Area Chapter sponsors the Celebration of Old Roses on the Sunday after Mother’s Day at the El Cerrito Community Center. For upcoming roses events that the group or its members sponsor, click here.